You must be a member to use the pool we do not sell daily passes. Members are allowed to bring guests per information below. In order to join the Outdoor Pool, you must register and pay a membership fee and agree to the Pool Policies, Rules and Regulations. Please read the Pool Policies, Rules and Regulations concerning admittance to the outdoor pool. Violations of these rules or conduct detrimental to others will result in termination of your membership. You must be a member to use the University of Delaware Outdoor Pool. This membership price covers the first two members of a family; each additional minor dependant is a $20 fee and each additional adult dependant is a $100 fee (see dependant criteria below). Per IRS guidelines, a child is considered a minor dependent through age 23. If you have a "dependent child" living in your house other than a biological child, you must have custody/guardianship of that dependent and provide legal documents of that custody/guardianship and proof of residencey as the same address, such as a school report card. Members ID cards will not be active until such proof is provided. Any person age 24 or older much provide a proof of residency at the same address, such as a driver's license, in order to be added as an adult dependent. Members ID cards will not be active until such proof is provided. The individual must be at least 13 years old. If under 18, a parent or legal guardian must sign the membership paperwork. Employees must present thier ID's when registerting to receive the discount or provide UD ID Employee number when registering on line. $6 per day -- University of Delaware Employees Daily Rate (only UD employees can use the pool at the daily rate). UD employees may use the pool for a charge of $6 per day with a valid I.D. 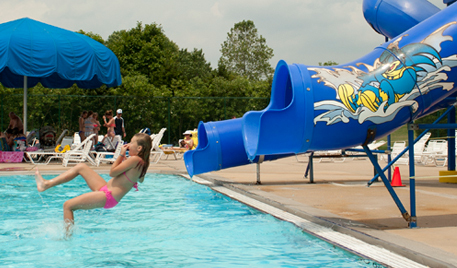 UD employees may bring guests to the pool for the daily rate of $6 per person. $6 per day- UD Daily Student Rate; UD students may bring guests to the pool at the daily guest rate of $6 per person. $6 per day-for all member guests.. A pool guest card, which is valid for 10 admissions, can be purchased by pool members at the pool for $45. Guests must be under the immediate supervision of the sponsoring member at all times. Guests may not remain within the pool complex without the sponsoring adult member. Guest fees are paid at the Outdoor Pool Entrance.	.
Members under the age of 13 may NOT bring in a guest without an adult member present.